A solar carport project supported through SCE's MASH program was recently unveiled at the Century Villages at Cabrillo. Native American leaders, community activists and supporters from the city and Port of Long Beach joined residents and the leadership of the Villages in the unveiling of the solar carport and urban forest projects. The urban forest project expands the already installed landscape barrier between the Century Villages at Cabrillo and the Terminal Island freeway corridor. The solar project, supported by SCE, will help generate 150,000 kilowatt hours of clean electricity each year, equivalent to removing carbon dioxide emissions from 22 cars. The Century Villages at Cabrillo community is adjacent to some of the most industrial land in Southern California. On any given night, the 27-acre supportive housing community is home to more than 1,000 people. Residents include former homeless veterans and non-veterans, families and children. The innovative public-private partnership was established in 1997 on a former U.S. naval housing site that was given to the nonprofit, an affiliate of Century Housing Corporation, for the benefit of the area’s homeless population. Adjacent to the Port of Long Beach and bordered by the Terminal Island freeway, the community has long sought ways to improve the livability of the area and ways to “green” the campus to reduce greenhouse gas emissions and airborne particulates. A solar carport and urban forest project were recently unveiled at the Century Villages at Cabrillo and are seeking to do just that. Native American leaders, community activists and supporters from the city and Port of Long Beach joined residents and the leadership of the Villages in the unveiling of the two projects. “These projects help make the Century Villages at Cabrillo a better place, a more beautiful place, a more sustainable place and a stronger place to live in,” said Earl Fields, board chair of the Century Housing Corporation. The solar carport will generate nearly 150,000 kilowatt-hours of clean electricity per year — equivalent to removing carbon dioxide emissions from 22 cars — while promoting the benefits of energy conservation. Supported by various grants and the Multifamily Affordable Solar Housing (MASH) program administered by Southern California Edison, the carport helps to bring the benefits of solar to the residents of the affordable housing complex. “At SCE we are doing everything we can to make solar power a more feasible option for more residents, whether they live in single-family homes or are part of a larger community such as the Villages at Cabrillo,” said Aileen Lagbao, SCE program manager for MASH. At the end of July, SCE had facilitated the completion of 129 MASH program projects in its service territory. The projects total roughly $34 million in incentives and there are another $9.4 million in projects in the pipeline. The California program provides solar incentives on qualifying affordable housing multifamily dwellings to stimulate the adoption of solar power in the affordable housing sector and improve energy use and the overall quality of affordable housing. Information on incentives about the program can be found on the California Public Utilities Commission site and atGo Solar California. The urban forest project expands the already installed landscape barrier between the Villages and the Terminal Island freeway corridor. 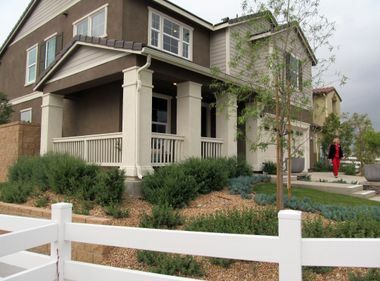 “While the trees will serve as a natural filter for localized air pollution and sequester carbon dioxide, they also serve to beautify the western perimeter of our community,” said Brian D’Andrea, president of the Century Villages at Cabrillo. The project was funded in part with grants from the Port of Long Beach Mitigation Grant Program for greenhouse gas reduction along with a grant from Wells Fargo through its UrbanLIFT program. The forest consists of nearly 300 trees, a walking path and several seating and light fitness nodes. “The urban forest and solar carport are helping to transform the landscape of the Villages, converting underutilized land and an asphalt parking lot into amenities that deliver both social and environmental impacts,” said Fields. 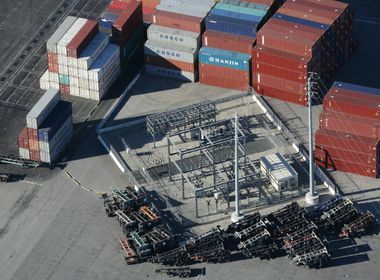 Helping Transform Long Beach Port Into Most Technically Advanced Shipping Terminal in U.S.